There’s a fair amount of competition for the dishonor of the worst Batman story of the Silver Age. 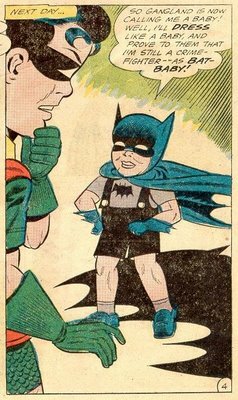 Although this time period was when I formed my affection for Batman, it is clearly the worst era for the character. Many of the Golden Age Batman stories are classics, but the SA Batman was marked by poor art (mostly Moldoff) and mediocre stories. 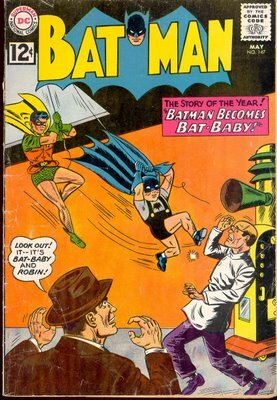 But I’m confident that no other story featuring the Caped Crusader could be quite as bad as Batman #147’s Batman Becomes Bat-Baby. A word of background on this. Superman and Action had recently published stories of Superbaby, Superman when he was a toddler. Obviously the comics sold well enough that it caught the eye of Batman editor Jack Schiff. Now it should be obvious that while Superbaby was still amazingly strong, could fly, and was invulnerable, Bat-Baby would have none of these advantages. In the story, the renegade scientist Garth (no other name) has teamed up with gangster Nails Finney. When Batman tries to catch the latter, Garth beams Batman with a ray that turns him into a baby. Due to a “flaw” in the machine, Batman retains his adult mind and strength. Never mind that Garth would have to be a pretty goofy renegade scientist to miss the enormous commercial applications of his product—suppose he could turn everybody into a teenager physically again; who wouldn’t be lining up to pay thousands? Batman does do some exercising to get the hang of his new body, but a day later he’s ready to tackle the world in his new garb. Yep, that'll teach those gangsters! However, Batman still supposedly weighs only as much as a toddler, which makes this scene highly unlikely. Mercifully they track down Garth and manage to reverse the effect. the kid batman looks very cute in the poster and he is helping his friend Robin too.